Pocket Wine is an educational app that serves as your personal guide to knowing and understanding everything about wine. 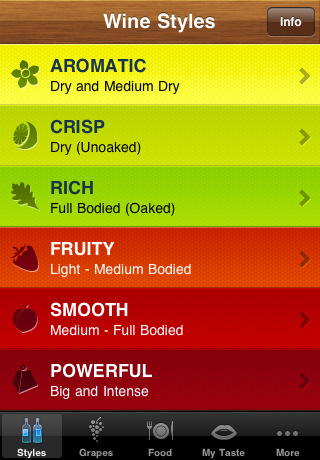 It was developed by Wine Paradigm, costs $3.99, and is compatible with an iPhone, iPod Touch, and iPad. If you have ever been in a restaurant and been totally lost while trying to match the dish you were ordering with the type of wine that would complement it, then this app was developed for you. It is a comprehensive guide to becoming a sommelier in training. 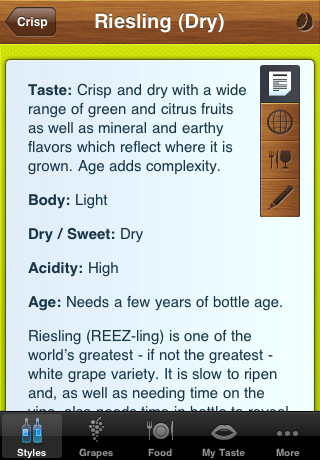 Pocket Wine provides you with everything including wine styles, types of grapes, a food and wine match up, your own personalized wine preferences, tips and trivia, and a glossary of terms used. Since there are countless types of wine from all over the world, Pocket Wine has quantified everything into 6 different styles: Aromatic, Crisp, Rich, Fruity, Smooth, and Powerful. In the Grape Index there are 56 different grapes listed in alphabetical order for you to peruse. Once you choose a grape to research you get a summary that includes the taste, body, tannin, acidity, and age of the grape. In the Food section you get Do’s and Don’ts, Food Types, and a synopsis of why it is important to learn how to pair up wine and food correctly. In Do’s and Don’ts there is a long list of what to do and what not to do while you eat and drink. Do: “Match the flavor strength of the food with the flavor strength of the wine.” Don’t: “Pair full flavored dishes with delicate or light bodied wines.” In Food Types there is a list of 9 different foods including meats, pasta/pizza, spicy food, and vegetarian. Each of the subcategories you are provided with give details of what kinds of wines to match the type of food with. Fish, for instance, should be paired with crisp whites, but there are exceptions to the rule that are also given. There is a questionnaire found in the My Taste section that, once filled out, provides you with a statistical bar graph that shows you what styles of wine you are likely to prefer. Pocket Wine is delightfully thorough and a really cheap way to make yourself look sophisticated. It is not all about appearance either, when you know how to pair wine up with food you get a better tasting meal. AppSafari review of Pocket Wine was written by Vanessa Paszterko on November 23rd, 2010 and categorized under App Store, Education, Food, Reference. Page viewed 4739 times, 3 so far today. Need help on using these apps? Please read the Help Page.